The preliminary results for 2018 PC shipments shave been released. Gartner reports that PC shipments declined 4.3% from last quarter and 1.3% from the same quarter the previous year. If you look at the history of PC shipments, you can see they stopped growing and started declining in 2012. 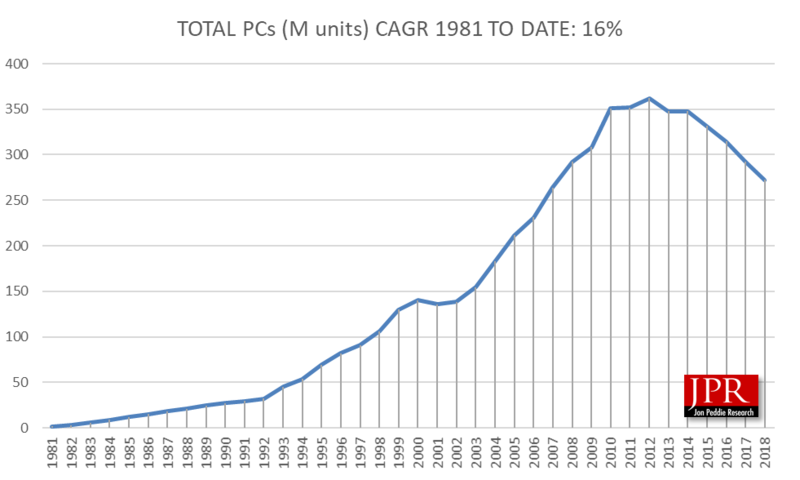 The PC market survived the turn of the century dot-com meltdown, and the massive 2008 housing crisis-induced recession, and kept on growing and expanding until 2010, with 2012 being the peak year in shipments. On January 27, 2010, Apple introduced the iPad, a revolutionary device for browsing the web, reading and sending email, enjoying photos, watching videos, listening to music, playing games, reading e-books, and much more. Was that the end of the PC? 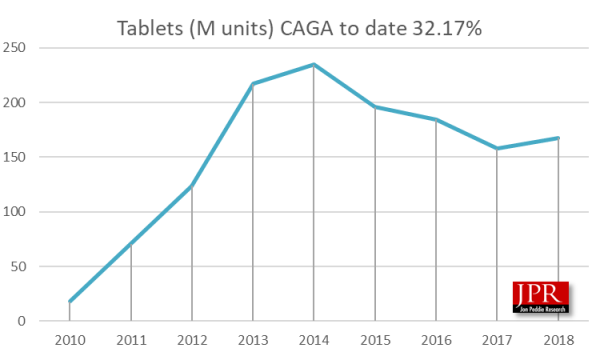 However, tablet shipments peaked in 2014, and PC shipments started to drop as indicated in the above, and the next chart. 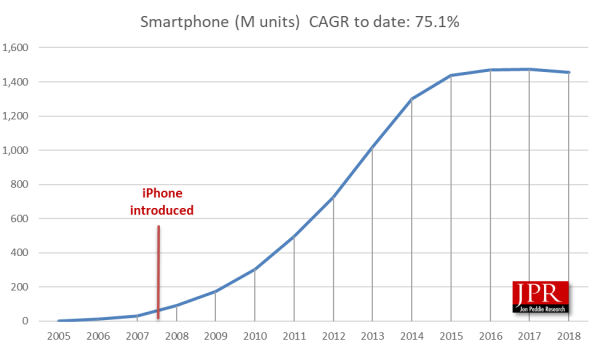 Smartphones which have increased in sales ever year flattened out in 2015. What happened to smartphones in 2014–2018? Game consoles didn’t do any better. 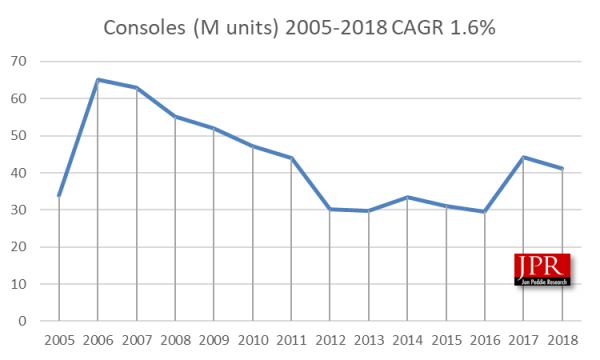 Game consoles have long product-life cycles, so their shipment activity is unlike the other platforms, but they too had a big drop in 2012 and only had a spurt of growth in 2017 because of new system introductions. 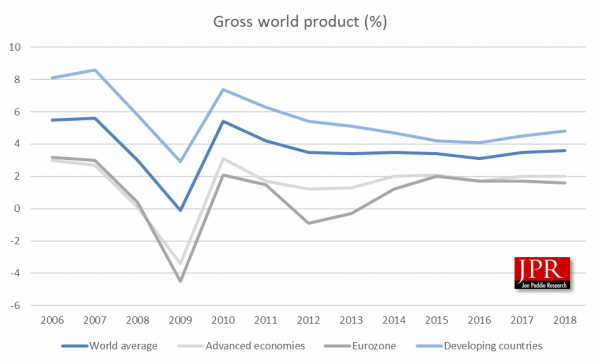 However, the world’s economy was in pretty good condition from 2010 having recovered and survived the recession. 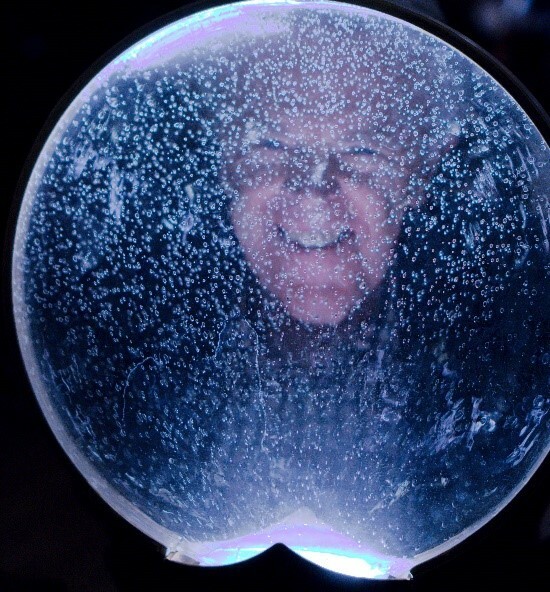 There weren't any major technological breakthroughs or announcements in 2014. In 2013, smart watches became popular but no one (in their right mind) would swap their PC or smartphone for a (not so) smartwatch. In 2012, at the big IFA consumer electronics show in Berlin in August, one of the significant trends was the rollout of 4K TVs. However, that wouldn’t be a productivity feature or communications tool, or replacement. It has, however, affected the gaming community. Gamers are embracing 4K gaming for consoles and PCs. There’s no plausible explanation for why PC shipments are declining, year-after-year since 2014, while the alleged replacement product shipments are also falling. You know the adage—if it ain’t broke, don’t fix it. The PC, tablet, and smartphone are great. They’ve been great for a while. They don’t fail, and there hasn’t been any compelling content or application software to drive us to buy a new one. The gaming market can take credit for much of the growth there has been in the industry, on all platforms. Engineering applications are also helping to push demand for processing power, and it is showing up in workstation growth, which is small in numbers, but higher in revenue and growth. AMD, Intel, Nvidia, Samsung, and Qualcomm may have engineered themselves out of a growth business. The parts they are making are so fantastic and so durable, the need to replace the boxes they are put in has just about disappeared. Would you buy a new PC to get the latest version of Word to run better? Not likely. How about a new smartphone so you can visit Facebook? No? The PC and smartphones have great, truly amazing new features. But not a single one of them is compelling enough to be an incentive to spend $600 to $2,000 for a new machine. Even the looming price increases and possible shortages due to the trade war between the U.S. and China didn’t spark any panic buying in the U.S. Replace and rebrand. So, it’s a replacement business now and that’s almost self-defeating since the things are being built better every year. Productivity tools like workstations and entertainment device for gaming are the primary growth areas. As a result, you can expect to see PC and peripherals (such as monitors and keyboards) tilt toward the gaming market. Their offering will be basically the same thing they’ve always offered except they now are branded as gaming whatever. Likewise, dumpy old PCs that just filled up shelf space in retail shops will suddenly become workstations. Tablets will transform into game machines and try to copy Nintendo’s Switch, or be branded as collaborative workstation devices—your workstation in the field. Smartphones will finally stop being phones and be cameras with an LTE connection—if it walks like a duck, and snaps pictures like a duck, then maybe it’s a…. It’s not that cloudy. Some people think moving everything to the cloud may be the cause for the demise of client machines. There’s probably a bit of truth in that, but the world’s population is still increasing, and so the new ones either have to be content using hand me downs or get their own client device to use the cloud or whatever other resources are available to them. We thought the year-to-year and quarter-to-quarter decline of the PC had flattened out and that we were on the trail to growth, albeit slow growth. Some of the declines may be attributed to Intel’s production problems, and AMD couldn’t pick up the slack quickly enough. Looking ahead the next couple of quarter will be bumpy. Nvidia is still dealing with its inventory issues; Intel says but hasn’t proven, that it has fixed its 10-nm production issues; and AMD is still ramping up. The OEMs are being buffeted by Tradewinds and wars, and except for gaming, there is absolutely nothing new in application software except some bug fixes, rebranding, and movement to subscription services in the cloud—doesn’t get much more exciting than that, does it? Chromebooks may be contributor to the PCs decline. The little notebooks have been making steady gains, and show no slowdown for the next few years. 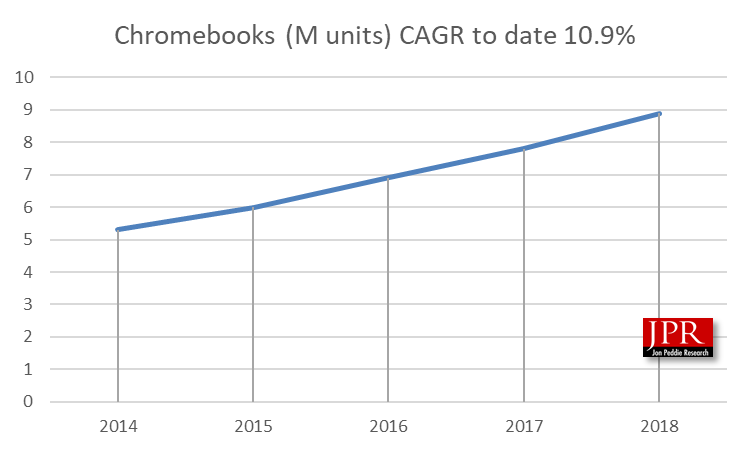 Gartner’s estimates for Chromebook shipments are even higher and projecting 10.9 million in 2017 and 11.9 million in 2018. Shiny competitor? When Qualcomm and Microsoft, and their first wave of partners (HP, Acer, Lenovo) go into production on the always-connected PC we expect PC sales and shipments to go up. Looking forward we can assume Intel will fix their yield issues, always on PCs will enter the market, and combined with Chromebooks (which are not counted as PCs) the use of PC-like devices will show healthy growth.